1) Go with a plan of what you want to attend and when. Simple but effective. Annual is overwhelming and even the paper program (who knows how much longer they will actually print those) is a lot to page through itself. Online, ALA had a cool Scheduler for the conference that allowed searching keywords and other things to find just what you are interested in and hone in on what you want to attend. I’m not one to go to the Exhibition Hall. In D.C., I was a grad student who wasn’t SLM or into YA so I perceived the Hall for merely grabbing kids/youth books or talking to vendors to work out deals for your libraries. This year, being from a vendor but attending on my own and not helping with the booth, I still felt the Hall wasn’t for me since I don’t currently work for a library and have buying power, and I still don’t need to pick up kids/youth books or graphic novels for my students/library. But I walked the floor and the author and illustrator signed books literally handed to me, I gave to my School Librarian friend for her library and students. Lastly, looking ahead at what was offered, I paid for the all-day workshop on linked data Friday so when I signed in, I knew at least what I for sure was attending first and it jump started my whole ALA because the workshop immersed me and allowed me to meet so many cool catalogers and coders and make new connections besides learning a lot and hearing about what some believe is the future for cataloging as well as the Internet. 2) Be flexible with your plan. The variety and options conferences offer truly make it a fun time. While you go with an idea of what you want to attend and do each day, allowing for change can give you the best experience. Once at the conference, I went to the first couple of sessions then decided to look through the program to see what else was offered. The workshop and session for linked data was very similar and it hit me that it’d be more valuable for me to attend sessions that would teach me something that I didn’t know and different topics would help with that. If you read my previous posts from ALA, or chose to go back now and read them 🙂 , you’ll see that I switched up my plan and went to a publishing, responsive web design, and learning styles session that each expanded me knowledge in library areas that are not usually my preference. I like seeing the library as a whole and understanding each part and aspect to know how they all work together. 3) Serendipity chooses you but you also choose it. Attended a session and hearing something that clicks an idea into place or gives you inspiration provides one way of looking at serendipity. Sitting next to the right person and being asked to talk to your neighbor to discussion a session topic initiates another side of serendipity (like my experience at the learning styles session). But I learned that serendipity is created as well; especially at a conference, people are chatty! Talk to anyone and everyone because you never know who people are or what they know or if you can help each other out. I met Nancy Pearl just by being friendly and introducing myself. I offered help and encouraged someone to e-mail me after the conference concerning the Safari product that I work on for ProQuest. Also, I met a Safari user, and a volleyball dad their for the tournament, in line at Starbucks and we both learned things from each other about the product and using it–I tweeted on June 24 that I catalog for him because I do think of the end user and what will best help them find this item and know exactly what it’s about. If a conversation is just small talk that’s fine but you never know when you might really help someone out by being open and friendly, such as when I explained cataloging and why MARC records are important to a small publisher who attended ALA and a metadata session to learn more. That was a favorite part of the whole conference for me and made the trip and costs worth it. Make the conference work for you while enjoying the ride as well! For more stories, read my other ALA posts. The point of a conference is to meet people so introduce yourself to others and especially panelists! 4) Take notes and write down what you learned at sessions and every evening. Though tired and wanting to hang out with colleagues, friends, and my librarian husband every night when the conference doors closed for the night, I made sure to post a summary of my day each evening to my blog before bed. It kept me thinking about what I attended and why, and if something didn’t work out well or I didn’t particularly enjoy something as much as I thought I would, it allowed me to be flexible for the next day and spurred me to page through the program to find more sessions that I would enjoy or learn about something that I could apply to my work or career. Writing notes and thoughts during sessions and workshops helps me make connections and remember things better. I hauled my computer along every day and could have just typed but I find that more distracting than just pen and paper, yet it turned useful when some sessions become interactive–such as the responsive web design one, and then it’s nice to pull slides or websites or code up on your computer in tandem. 5) Get involved. ALA is much more than just a professional organization run by a single board. Many committees and subcommittees make up ALA and offer tons of opportunities to get involved if you want. Most of the sessions are put together by these committees and subcommittees and even their meetings can include panels and talks about topics related to the group so it’s worth looking those over and attending them as well; as one person at ALA told me, unless the session/event/meeting is marked “closed”, anyone at ALA can attend it. Besides helping out with ALA itself, there are other ways to get involved such as finding out from editors and library journals if they have publishing opportunities. Also, there are related groups such as Spectrum Scholars and Emerging Leaders, and more. Prior to ALA Anaheim, I responded to a call for volunteers for an ALCTS subcommittee and can proudly say that I accepted the two-year position of Co-Vice Chair 2012-2013 followed by Co-Chair 2013-2014 for the Cataloging Norms Interest Group! This means I’m attending Mid-Winter and Annual for the next two years (four conferences!) to serve on the subcommittee and help plan their meetings and conference sessions. I can’t wait to be involved and see where this leads me next! Finally, take 10 minutes and listen to the super awesome “Live from ALA Annual 2012” LiTTech episode #36 by Learning Technologies Librarian, and grad school friend of mine, Emily Thompson. The brief episode takes live audio clips that Emily got from ALA attendees–including a few famous authors who talk about the importance of libraries and the ALA conference. Definitely worth the listen, and check out the show notes to see who everyone is! I’m in there twice, once talking excitedly about my blog stats during the conference–I tweet and handed out lots of personal business cards with my blog and Twitter handle listed on them–and another time as the person who Addie tells the fire alarm story too–where you around for that? I think I was getting lunch then and missed the exodus of librarians from the conference center; listen to find out what cause it! Also, Emily and Addie have another episode up that’s there wrap-up from ALA, so at least I’m not the only one who’s had a lapse in posting it. I’ll listen to it tomorrow at work, since I have a well-deserved, and needed, day off today. Again, lesson number 4, write notes and blog that same day; this post was supposed to get done on the plane ride back and be up when I got home to my Internet but time can get away especially when you are recovering from at very packed five days of busy conference going, followed by trying to return to your normal work routine while still jazzed from all the cool people, sessions, and ideas from ALA Annual. Hoped this helped and you picked up some great tips! I’m sure I’ll learn more tips and tricks when I attend Mid-Winter this year while getting involved. I’ve never been to Seattle and cannot wait! See you there? Or find me in Chicago next summer! Comments Off on ALA Wrap-Up: About Time! The title for this post is meant in a good way–as all days at ALA Annual, it’s always busy and full of good stuff and great people to meet. Although many seem to be taking off day. For me, the conference really is a marathon as I’ve done all day Friday through Monday and fly out tomorrow mid-morning; though I don’t sleep on planes, there is no way that I will stay awake for that 4+ hours flight, which I need/have definitely earned! My plan of three sessions today turned into two due to cancellation which gave me an extra long and well-enjoyed break since I’ll be meeting with friends for coffee and catching up later this afternoon and hopefully getting free tickets to The Perks of Being a Wallflower, an advanced showing tonight! Session 1) Publisher/Vendor/Library Relations Interest Group had a panel of speakers made up of a representatives from Springer and Project MUSE, plus a couple of librarians (a cataloger and admin who used to be a cataloger) from the University of Minnesota (Go Gophers!). Being in another building likely kept the numbers down, plus being on Monday but it was still well-attended considering, with around 30 people there at 8 a.m. this morning. Since both are more publishers than vendors, it was interesting to hear about what they do to create their MARC records–usually machine generated initially then outsourced to OCLC/SLA for cataloging enhancements before going to the libraries with the e-books. The librarians obviously addressed the growing difficulty and frustration with editing and tweaking batch records that have various quality and consistency issues not only across multiple vendors but within a single vendor some times. Thankfully, the publishers said that they gather and want feedback for providing what libraries want. And the librarians, thankfully, called for action and accountability among libraries in order to share information and band together to approach vendors and publishers with their needs and demands for better MARC records as budgets, staffing, and work loads change rapidly. During the Q&A I did speak up and mention our (apparently special) department of full-time catalogers and that we do I-level records; I take it for granted because that’s where I work and my environment so it was shocking (but shouldn’t have been) to hear fro the panelists. Also, I piggybacked off of the comments about collaboration on everyone’s part to get better MARC from vendors and publishers and encouraged libraries to work together and approach them with their desires and needs. Another cataloger mentioned the BATCH List listserv that shares valuable information about record changes that are useful for all libraries. Lesson learned: Vendors and publishers can and will provide better MARCs if it means more business for them by giving libraries what they need in an economically tight time for everyone. Just ask! We all are in it for the end users so why not collaborate and make metadata better, which is now more important than ever for discovery. Session 2) CANCELLED Seeing is Believing: Understanding Data Visualization for Library Research didn’t end up happening but sounded very practical and would have been useful. But I won’t complain about having a longer break before my afternoon session, although now the tiredness is setting in the more I sit still and am left to my own devices rather than being stimulated by a session. Nap or upcoming session? Onto session 3 for the day, just because it will be cool and has great speakers! Sleep is for the plane tomorrow. Lesson learned: Maybe 3 sessions plus other activities, the exhibit hall, and networking is too much. But I’m still plugging along and fitting everything in that I can to really squeeze the most out of ALA while I can! Session 3) Riding the Publishing Roller Coaster: Practical Strategies from Research to Writing addressed the writing process through getting published. The panel had both authors and editors (who were also authors!) that gave great, practical tips and advice. It’s always refreshing to hear others talk about all the hard work and difficulty and challenges that go into writing and publishing. Too much to share but if you are interested in learning more, I could do a longer post delving into what was said. Most was common sense but needed reminding; I nodded a lot during the session, if that puts it into perspective. They all articulated their advice and tips eloquently. Lesson learned: Reminded that writing is hard work so be humbled and respectful of your self and other’s works. Put yourself out there and be flexible when need to yet stick to your convictions but be able to explain why if you really don’t want a particular change made to your work. After the last session, I meet up for coffee with UMich grad school friends and one of our professors to catch up! 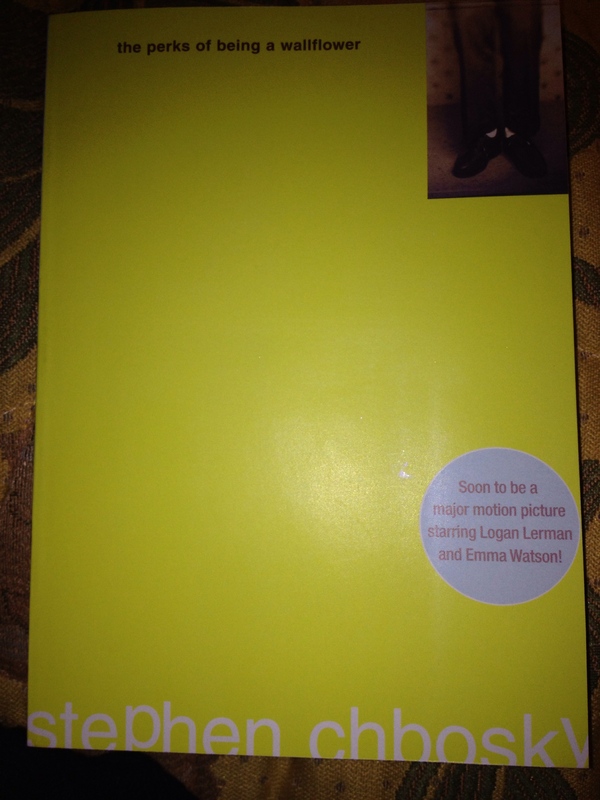 Soon after, we headed to get tickets for the advanced showing of The Perks of Being a Wallflower! Amazing movie with Emma Watson, by the way. How did I miss this book growing up? 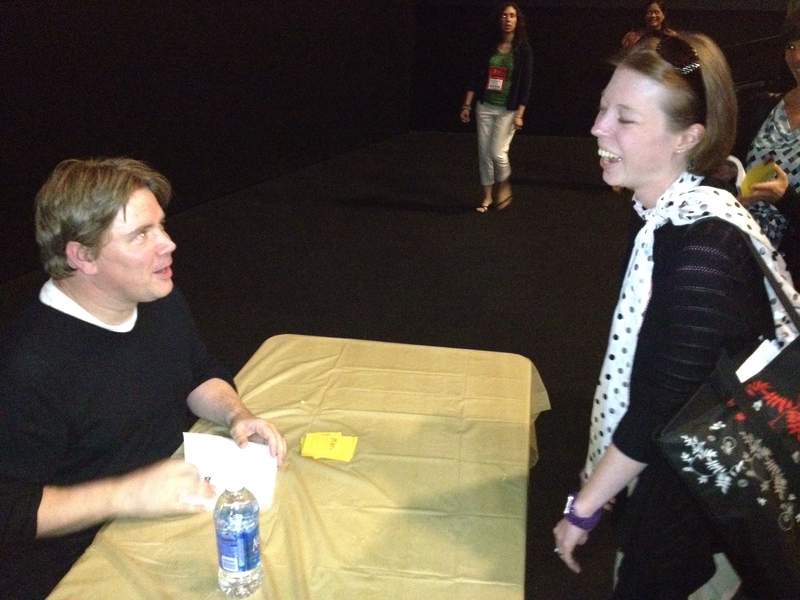 However, after the film, everyone got a free copy of the book and the author was there for q and a and book signing! It was a fun evening with good friends–a great way to wrap up ALA Annual! Go see the movie when it comes out and read the book until this! My new favorite movie! Look for a post tomorrow, likely while at the airport, about tips and advice about attending ALA and what to do now that we are all still a buzz from the great sessions and people here. My friend and classmate, now Learning Technologies Librarian, Emily Thompson hosts a podcast called LiTTech with another friend/classmate now School Librarian, Addie Matteson that address libraries, education, and technology. Not too long ago, I spoke as a guest about cataloging with Emily, which is also available for download on iTunes as well. They were here at ALA collecting sound bites for their next upcoming podcast, so keep an eye out for that; I’ve heard some bits already and it’ll be great and fun to listen to! Appropriate title but also reminiscent of a subject heading that I discussed months ago! Today, again, was jam-packed with sessions but that’s the general point of conferences. Three is the magic number for me because that’s about all I can max out for intact of information. Session 1) ebrary: Strategic E-book Acquisition for Academic Libraries provided a breakfast before their talk about PDAs (patron driven acquisitions) with actual libraries to tell their stories and experiences. Hearing from others attending, it’s the best conference food, and it was good. Even though ebrary is a part of ProQuest, hearing the concerns for librarians in the room as well as their wonderful stories. Plus, several higher ups from PQ also attended, including CEO Kurt Sanford. As of right now, apparently choosing the short-term loan option has a fee that doesn’t go then towards the purchase of the book later so some of the libraries just select the PDA option. Maybe this will change in the future. Feedback is always taken to heart at ProQuest, from experience, but not always acted on. Lesson learned: Sessions with food are well-attended and it’s great when presentations by vendors that address topics rather than just a product pitch are much more interesting and useful. Session 2) Responsive web design: get beyond the myth of the mobile web showed just how easy and necessary it is to make library websites that adjust to the size of the device accessing them. The cool thing about this is that it’s one website with extra code that has different tweaks based on the screen size of the device, using percentages instead of pixel widths. The example website is LOL Library by presenter Matthew Reidsma that as you view it on a computer browser, resizing it will show you all the variations, the rearranging of the same content for all the different devices. He’ll put everything up online, including the code at GitHub for the LOL Library website. Lesson learned: Everyone needs to do a single website that is built with responsive web design. There are lots of resources on the web and Matthew posted his slides and presentation so when you have time, watch it and make use of it! Session 3) Learning Styles: Fiction, Nonfiction, Mystery? taught me all about what learning styles are and how to use them in instruction–there are 21 different types so it varies greatly. The three panelists were wonderful and it was more informative than practical which for me was perfect since I was new to the idea coming in. Oddly enough, there was a turn-and-talk discussion with the people next to us, and since I don’t teach or do instruction, I listened a lot to my neighbor and spoke of my husband Steve’s stories of his teaching that he’s shared with me; the librarian I spoke with was very skeptical about the presented information and told me about what his alternative views are on what’s important and affects instruction to make it more meaningful and useful for students. Lots of food for thought! Lesson learned: Though people are presenting on a topic, sometimes it’s good to be a skeptic and think about different ways to approach the issue and other creative solutions. Plus, my discussion partner mentioned What best college teachers do as a great practical book–so look into it if this is important to your work! Exhibit Hall for some is the essence of the conference but for me I avoid it. One, lots and lots of people make it overwhelming. Yet what it really comes down to is that I don’t need or want to collect books, plus I have no scope for talking to vendors or other companies that provide equipment and software to libraries. It’s weird working for ProQuest in that sense but it also means that I don’t have to wait in lines for book signings or pack/ship tons of books home. During some down time between sessions, I did wander though out the whole hall during a fairly quiet time, so I literally got handed books that got immediately singed by the authors and illustrators. Thank goodness my friend Addie is a school librarian and happily took the handful that I collected. 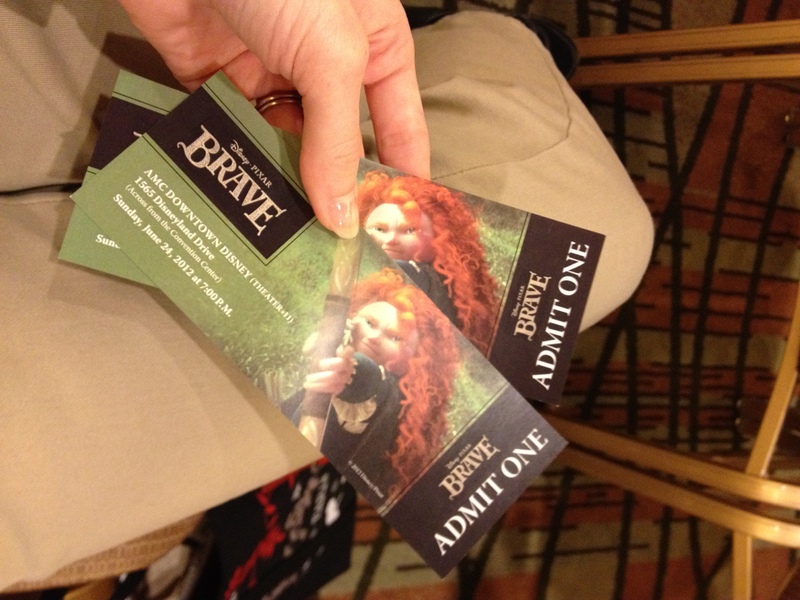 I did get registered for a chance to win two Kindles, and finally found the booth giving out free Brave tickets. Dinner with friends and then watching Brave for free in a theater full of librarians was the highlight of the day, though. Seriously, it’s a great family movie and a really fun daughter/mother adventure so ladies go with your moms! Tomorrow morning begins at 8 a.m. yet again–what is with such early morning sessions? Start early, end early to give people an evening for other stuff, I guess! Full plate yet again. How about you? Very busy day today! Lots of wonderful sessions which makes it hard to decide what to attend. In the end, the three sessions I chose today taught me a lot and were enjoyable. Session 1) LITA’s Linked Data and Next Generation Catalogs covered a broad base of what Linked Data is, why libraries should lead the charge, and how to do so. Different libraries and vendors on the panel talked about the topic generally while also delving into specifics of projects and current use of Linked Data. Unfortunately, attending the all-day Linked Data workshop yesterday at the pre-conference meant that some of the speakers also presented at this event as well and while they weren’t the same presentations, there was overlap. But being new to Linked Data, it was good to have things reiterated and spoken about more broadly. A few others from yesterday came as well but doing one or the other would have been sufficient, especially since this session lasted 4 hours and covered lots of ground. Lesson learned: Instead of trying to hit all the same topics, vary your sessions to learn more and expand your horizons–plus you have the chance to meet so many more people of all different types. Session 2) Transforming Technical Services: Growing IT Skill Sets Within Technical Services Departments provided a practical realistic look at how to increase tech savvy among TS staff. Several libraries each gave their take on what it takes to increase, encourage, and support professional development in application development, software training, and bringing more tech into library work to ensure projects are done by librarians who understand the system, users, and needs rather than hand it off to already busy IT people. Oddly enough, all the speakers rounded back on the same or similar tips and concerns but each offered their own way of how they handled their situation and what their solutions and realizations were. So useful. And not just for TS–this applies to libraries in general as well as general business. In a nutshell, talk the the staff to find out what they use and need but remember that they don’t know what they don’t know at time, encourage and support relevant learning that will make their work easier and more effective, start with small and meaningful projects that are achievable and leave a lasting impact to increase buy-in, and work within the knowledge and abilities of the staff to drawn on the best of what they can offer pairing it with the technology to increase their effectiveness. Lesson learned: Though libraries are becoming more techie and librarians with tech savvy skills are needed and necessary these days, as one speaker said “Remember, we are not growing programmers”. Session 3) Traveling the Spectrum: From Interstellar Adventures to Epic Fantasy, the influence of Science Fiction and Fantasy on the World Today (i.e. the George R.R. Martin talk!) was my guilty pleasure session of the day and a great way to relax and enjoy a fun author-talk. Besides George R.R. Martin, Blake Charlton also spoke and, for some reason, Lois McMaster Bujold wasn’t billed but was on the panel as well. Each talked about themselves, their paths to reading and writing books, and how Sci-Fi and Fantasy shaped them and the world. Though I’ve not read a word by any of these authors (I LOVE the HBO Game of Thones show), they are now three of my favorite authors and I vow to read their works as soon as my year of reading my bookshelf is up, which isn’t going so well this month, lol. Each was so humble and had tough lives that lead them to not only books that engaged and inspired them to read and eventually to write. Authors that talk realistically about writing and what it took to get their win me over instantly because, like most things, book writing is not magic and neither is getting published. Hard work and persistence win out. Once I finish Camp this June, I might be crazy enough to write another 50,000 words in August for it again and this time return to my roots of Fantasy and Sci-Fi as well; it’s been a decade since I began my Fantasy novel that never really got off the ground but after this talk today, I’m ready to commit a month to returning to those worlds and characters and actually writing the novel now. Lesson learned: Listening to them all made me realize that fantastical literature/fiction is escapist for a reason; most Fantasy and Sci-Fi authors and readers lead hard lives, in one aspect or another, and the release and travels and adventures that those genres provide enrich everyone’s life who writes or reads them. And as with most genres, there is quality and fluff so there is something for all tastes and preferences and if you haven’t read any, find out about them (use Reader’s Advisory at your library) and crack open some books and see what they are all about! Now, time to briefly look over my schedule tomorrow to set a game plan for more sessions! Are you ready for yours? I’ve talked about Code Academy before and it’s a great starting point if you don’t know how to code, or need a quick refresher. However, there is no pressure since it’s not a real project so my completion level is fairly low. I’ll do a lot sometimes when I’m really in the mood but normally I can find something more interesting or pressing to do–like blogging! Now, in the title I promised “cataloging and coding”, so here you are: let’s talk about similarities between them. Most obviously attention to detail, for coding that entails closing all the tags that you open and pairing them up correctly, while with cataloging it’s getting MARC indicators right and finding out things like the title proper and actual date of publication. Both are an art and a science–there are rules and standards yet flexibility and interpretation are encouraged and well used. Also, for the majority you work alone but still work with others from time to time, to engage, make decisions or work together on something. I’d also wager that both require being either tech savvy or tech willing; for cataloging it’s mainly software use and online research skills, while for coding it’s programming and probably online research skills as well. Also, both have robust Internet networks–usually ListServs for catalogers, and web forums for programmers/coders/developers. However, there are many differences. Coding requires more technological knowledge, like knowing computer programming languages (and yes “languages” is appropriate because they are like foreign languages with their own vocab, rules, and patterns). Cataloging can be and is done by paraprofessionals without Master’s degrees; more complex stuff is done by professionals usually but now with vendors such as ProQuest (like me!) creating I-Level records, shelf-ready items that are fully cataloged are appealing to a lot of libraries these days. Also, coders and catalogers are generally two very different nerd types–geeks versus bookworms; happy hours might not be very fruitful between the two, one cares about the latest Doctor Who episode and the other cares about the 50 Shades of Grey kerfuffle in Florida. Okay that’s not entirely an accurate depiction but many people see those distinctions. Lastly, coding builds something, like a website or iPhone app, and cataloging records information for an item so it can be found. The purposes are very different as well as the end products. But at the end of the day, I believe if you can do one that you’d be good at the other. Come on you coders, leave loftily FaceBook and come work for a library! Hee hee! Or if you are a cataloger, taking a programming or web coding course; you can always start on Code Academy! For me, the future looks exciting and bright, with the possibility of cloud cataloging. What a perfect combo of coding and cataloging! Granted that like most ILSs, the code will only be viewed by the Systems Librarian but still I can dream. P.S. GREAT NEWS! I’m attending ALA Annual in Anaheim after all! Woot! If you read my blog and will be there and want to meet up, drop me a line–or maybe I’ll bump into you at a cataloging or e-book session! If you do happen to sit next to be during a session, though, be warned, I’ll talk about MARC indicators, subject headings, and perhaps even the dreaded RDA. Plus, I’m signed up for a session entitled “Creating Library Linked Data: What Catalogers and Coders Can Build”! It looks so cool and I can’t wait (see, there’s that nerdy side again)! And to think, I planned this post before I knew I was going to ALA and found that killer event. Yea for serendipity!